`diskutil list` shows type Windows_NTFS, but `Disk Utility.app` shows type ExFAT. So What is the type? It shows Windows_NTFS. And then I launched Disk Utility.app. It shows me USB External Physical Volume • ExFAT. I am not going to paste the screenshot, but this is what it displays. This is very weird. How to tell the true file system type? Thanks. Btw, I know I can reformat it with Disk Utility.app, but I just want to know the current type in this question. Thanks a lot. There is no mystery here. The volume is ExFAT formatted. The drive is using the legacy Master Boot Record (MBR) partition scheme. The diskutil command displays the TYPE based on the single byte partition id. In your case, the partition id is a hexadecimal value of 07. The diskutil has this hardcoded to the string Windows_NTFS. This partition id is also used for Microsoft's ExFAT format and IBM's HPFS format. 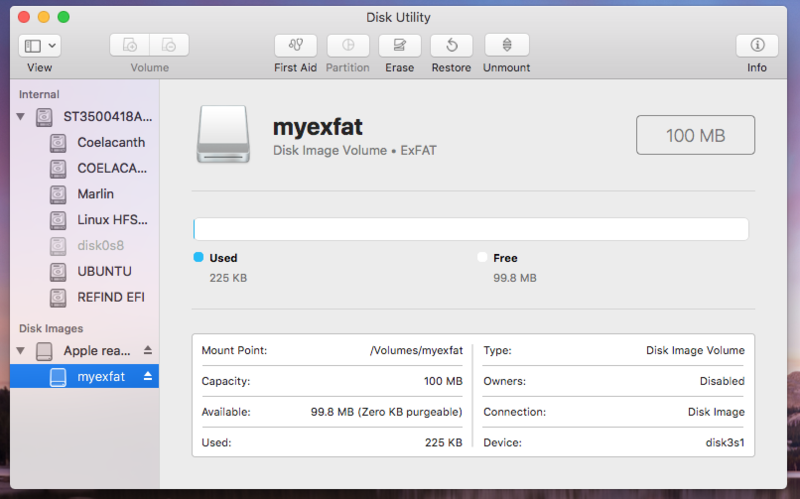 The Disk Utility application actually looks at the contents of the volume to determine the format. You can get the partition id by entering the command fdisk /dev/disk1. A list of MBR partition id's can be found here. The diskutil command does know the partition is ExFAT formatted. If you enter the command diskutil info /dev/disk1s1, you can see for yourself. The diskutil list /dev/disk1 command displayed the Partition Type, while the Disk Utility application displayed the Name (User Visible). Below is the diskutil list /dev/disk3 output for a small mounted file named exfat.dmg. Below is what is shown by the Disk Utility application. The output from fdisk /dev/disk3 shows the partition id as 07. The output from the command diskutil info /dev/disk3s1 is shown below. I am using macOS High Sierra version 10.13.6. Not the answer you're looking for? Browse other questions tagged disk-utility partition .